One of the most memorable times in your life and Ace DJ Entertainment keeps it that way. 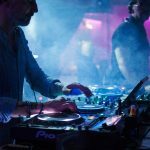 Our DJs understand it is a celebration and light up the room with charismatic personalities and dynamic attitudes for fun, freedom, and of course lot’s of dancing. Just how to customize your wedding in one fee with all of our deluxe enhancement packages such as photography, lighting, videography and more! We understand that picking the DJ for your wedding is an essential part, and offer you the opportunity for our DJ to meet you at a place convenient to you, so that you can have peace of mind that everything will be catered to your idea of the perfect wedding! Give us a call, Chat with us or fill out our form to get started and make your wedding an ACE! 95% of brides polled after their reception regretted choosing a budget DJ or family friend and wish they had gone with an experienced, established professional. 84% of all couples that chose a band to entertain at their wedding, said, if they had it to do over again, they would have chosen a disc jockey. *These statistics were published in Bride & Groom Magazine in 2005. Sources include: Simmons, 2001; National Bridal Service, 2003; The Knot, 2006; Brides Magazine, 2009.